In March 2017, ONR granted its first consent for the start of construction of a twin EPR nuclear power station at Hinkley Point C. The consent covers the placement of the structural concrete for the first nuclear safety-related structure, the 'technical galleries' at the Hinkley Point C site. The technical galleries are a series of underground reinforced concrete structures to be located beneath the site and some above-ground structures, connecting services such as cooling water and electricity. Our regulation will continue throughout the construction process to permission other subsequent key stages of construction, leading to granting the final Licence Instrument (usually consent to commence operation). In September 2016, following a comprehensive review of the Hinkley Point C project, and a revised agreement with EDF, the Government announced its decision to proceed with the first new nuclear power station for a generation. This followed EDF Energy's announcement of its final investment decision in July 2016. In Spring 2015 NNB GenCo Ltd announced a pause to the overall programme for the Hinkley Point C Project until commercial progress could be made on the project. NNB GenCo Ltd realigned its organisation with the aim of maintaining its core nuclear safety capability and securing continued compliance with the Nuclear Site Licence. ONR monitored the impact of the changes to NNB GenCo Ltd's organisation via the licensee's arrangements for compliance with Licence Condition 36 - Organisational Capability. During this period, ONR inspectors also continued to engage with NNB GenCo on its programme of activities related to preparation of the Hinkley Point C site specific safety case, the detailed design of the plant and the procurement of equipment. On 19 March 2013 the Secretary of State for Energy and Climate Change granted NNB GenCo Ltd a Development Consent Order (DCO) to build and operate a new nuclear power station at Hinkley Point C in Somerset. give ONR the necessary powers to enforce relevant regulations and permission activity at the site. In December 2012, ONR completed the Generic Design Assessment of the EDF and AREVA UKEPR™ and issued a Design Acceptance Confirmation (DAC). The DAC does not give a licensee permission to construct and operate a plant based upon the UKEPR™ design. 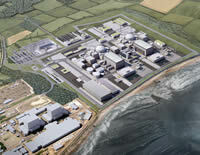 However, ONR will take the DAC into consideration when assessing the adequacy of NNB GenCo Ltd's safety case for requesting permission to proceed with construction, commissioning and operation of the EPR™ units it is proposing to install at Hinkley Point C.
implementing a programme of interventions or multi-discipline team inspections aimed at gathering evidence to form a judgement on the capability of the NNB GenCo Ltd organisation and the effectiveness of its management arrangements. Acceptability of the design and safety case. Security and Safeguards, including conventional safety.